Tourism infrastructure is growing in the Yamal-Nenets Autonomous District. Trips to the region are no longer just for the most adventurous travelers. The Russian North is fast becoming a popular destination for tourists, and not just extreme adventurers. In the past two years, the number of visitors to the Yamal-Nenets Autonomous District alone has more than doubled, to 30,000 people. The increase in traffic should come as no surprise; the area offers breathtaking nature, tundra, great fishing, archaeological finds and the lively and welcoming traditional culture of northern peoples. Even the reindeer are friendly, allowing guests to pet them and feed them bread. In the Yamal-Nenets Autonomous District, fishing, mountain climbing, hiking, rafting and skiing are popular ways of experiencing the ethnic flavor of the indigenous peoples. There are at least 60 tourist routes in Yamal-Nenets, catering to every taste. "Here on the Yamal Peninsula, life is free in every sense: no boundaries, no pressures. The fishing is abundant, and you even get a tent with heating, light, gas stove, and a bed with linen, pillow, and blanket," wrote a tourist in an online forum. Climbers consider the Polar Urals to be one of the most complex and interesting routes. For those who prefer to keep their feet on the ground, summer fishing facilities are available at Lake Varchato, which translates from the local Nenets language as “mountain lake” — a recreation center provides all the necessary services. Local fishermen claim that the pike here weigh up to 30 lbs. According to residents, one of the best rafting trips is on the Sob River. Just 20 miles long, it does not require any experience or special training. For those more advanced at river travel, there are many other challenging routes to try. Many visitors to Yamal-Nenets try to take at least one tour that allows the opportunity to experience local culture. 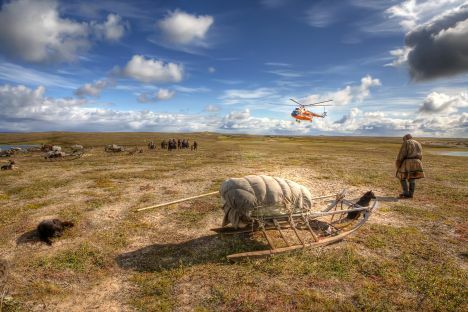 There are seasonal trails following the route taken by the nomadic Nenets people, as well as short trips to explore the traditional culture and way of life of reindeer herders. Along the way, local tour guides instruct their charges in deciphering nature’s delicate signs in the silent tundra. And no trip would be complete without trying the local cuisine: stroganina (thinly sliced meat or fish), reindeer broth, cranberries and cloudberries. Many of these “ethnic” tours also allow travelers to try their hand at traditional local sports: throwing the tynzyan (a loop for catching reindeer), sled jumping,and ax throwing. The Arctic Circle is one of Yamal’s calling cards, drawing tourists from around the world to the “edge of the earth” (translated from Nenets, ya means “edge” and mal “earth”). Anyone who arrives in the regional capital of Salekhard and crosses the Arctic Circle receives a personal certificate confirming the achievement. Archaeological discoveries in recent decades suggest that over 2,000 years ago the site of Salekhard was already home to settlers who would later become part of the Nenets and Khanty tribes. It has become clear in recent years that tourism here could soon become one of the key sectors of the regional economy and the demand for exclusive Arctic tourism in these territories — full of the romance of the North and its unique wildlife and culture — is set to grow exponentially. The tourism industry already employs more than 11,000 people, and as the infrastructure increases, so will the number of tourists, who return home with vivid impressions they can pass on to others. More useful information for tourists and travelers is available on the Yamal Tourism website at http://yamaltur.ru.